Hi, friends! Hope you are having a wonderful Wednesday! :) For this week's Wedding Wednesday, I'm showing you some adorable banners for photo props! The credit for this entirely goes to my awesome family. They came to town a few days before the wedding to help me with some last minute details and brought a few crafts with them that they had secretly been working on! 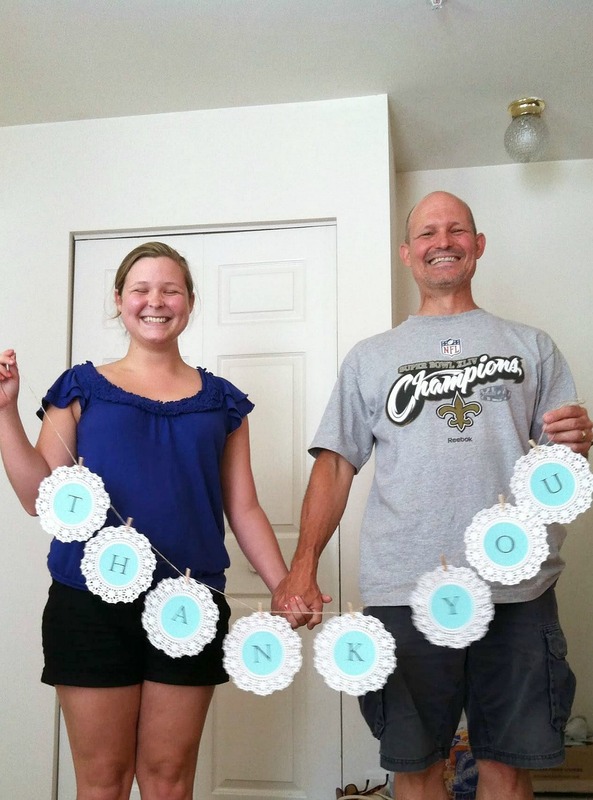 Here's an embarassing photo of my dad and my sister demonstrating how my husband and I should use the "thank you" banner they made for our thank you cards. Gotta love them! To make the "thank you" banner, they printed letters onto colored paper, cut them out into circles, and glued them onto doilies! Then they strung the letters onto a ribbon with mini clothespins! So cute, right? And super easy! This next photo is the one we used for our thank you cards! We added our names and wedding date across the bottom and had them printed at Vista Print. I used Vista Print for almost all of our wedding printing needs because you can buy Groupons and print stuff for super cheap! The other sign my family surprised me with is this adorable Mr & Mrs sign! They bought wooden frames and wooden letters from the craft store, painted them in our wedding colors, and then glued the printed words "Mr." and "Mrs." to the back of the frames. They tied them together using twine. So cute!! Thank you, Bre! I think the Mr. and Mrs. one is my fave too! Hi Nicole, Just found your blog and absolutely love it! It seems like we are interested in all of the same things, your wedding signs are super cute! My MOH made one for my hubbs and I for our wedding several months ago! Love it!